The Kinsei 6 has a gender-specific midsole for enhanced cushioning and shock-absorbing features. Half a dozen color options in vibrant and exciting designs will turn heads with ease. The Asics Kinsei 6 is one of the most luxurious rides in town, based on the observation of a few testers. Some runners found the shoe comfortable. The shoe's durability is noted in some reviews. Several users prized its effectiveness when taken to the gym for workouts or aerobics. A few testers marveled at how the heel cup holds the heel snugly in place. A spacious toe box accommodates a variety of runners. This is quite an expensive shoe. Mainly limited as a daily training partner or for luxurious runs on the road. One of Asics’s most expensive and newest lines goes all out where cushioning and comfort are concerned. A substantial price point, despite the high-quality materials used and its weight, limit the appeal of the Asics Kinsei 6. This shoe is tailor-made for middle of the pack runners who are just looking to keep themselves fit or as an everyday training workhorse as the decent arch support and unbelievable comfort will make running more fun. Asics Gel Kinsei 6: The best that Gel can be? After several years using Mizuno Wave Creation, a friend of mine told me about Kinsei, and I got my first pair back in the 3rd edition. Since then I`ve been using them… so let`s review this latest version. I usually go for darker colors so once again I got the dark grey one but as always, there are other more colored options you can check at the top right corner. Overall, I found the design very sleek and modern, with a good balance between upper fabric, golden logo, and midsole thickness. You can feel it is a well-constructed shoe with premium materials. Gel Kinsei is Asics’ shoe with the most amount of Gel, no wonder they write it on the back of the shoe. And as a result of all this Gel, the step by step feeling is very good. Nothing bothers the feet from inside, and heel support is tight as it's supposed to be to get your running safe without moving the feet along the boot sole, with a good amount of plush around the ankle. In terms of size, when compared to other brands like Nike and Adidas, I would say Asics shoe size is half a size smaller, so I would recommend you get half a size bigger. For the upper, I felt Asics provided a significant increase compared to the 5th edition, with double layer fabric and additional seal for the toebox as you can see above with the 2-level grey stripes both proving support edge-to-edge and also toe to the sole. As a result, after 1 year of usage, the toe box is just like new. A big improvement from former edition, whereas I got it popped out. You cannot talk about Gel Kinsei without talking about its special Gel technology. Different from Kayano and Nimbus, Kinsei was Asics`s only model to provide Gel throughout the midsole from back to front until the launch of 360 back in 2015. And when you put it on, you can feel it right away both on walking and general workouts as well as a performance running. It is extremely soft, however, also heavy. In addition to that, I have to highlight that after a couple of months of usage, I felt that the Gel was not as working as it was at first, with significant decrease both in smoothness and also responsiveness. This was a big disappointment and one of the biggest reasons that I started to try out other cushion technology from competitors. Another important point is that as the cushion went old, I also felt my feet sole getting hot after long training (1h+), which was a bit strange, therefore, in conclusion, I stopped wearing it after around 18 months of usage. So a big minus here. Except from Dynaflyte series, Asics are known to be heavy and with Kinsei it's no different. While my Nikes are 330-340 grams, Kinsei is ~15% heavier with 376 grams a pair for a US Size 10.5. This is explained by the additional details and materials used on the upper as well as the Gel on the cushion and thick sole (see below). 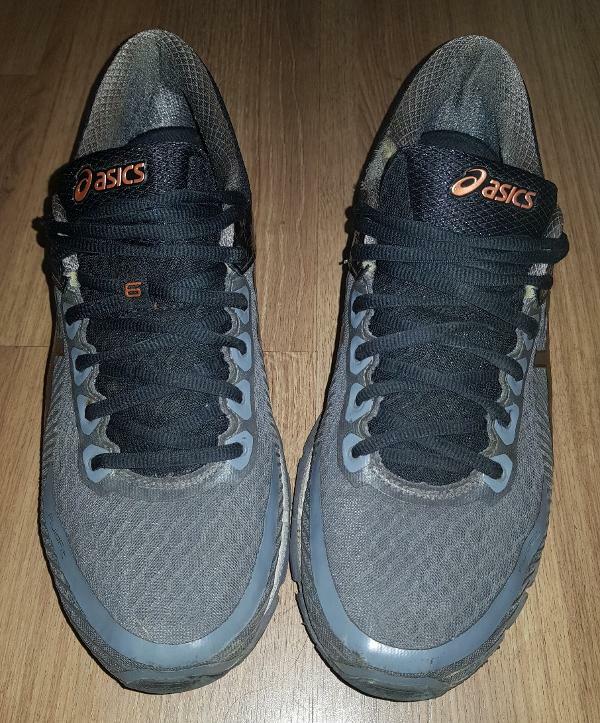 I would say Asics should work on the weight of their shoes, as for long distance training it can provide a significant decrease in performance and muscle tiredness. Kinsei`s back is well constructed with amazing support throughout all the region from heel all the way to the ankle. As a result, despite Kinsei's primary objective as a road shoe, you can say it is a versatile shoe as the material and thickness of the sole gives more grip which also helps the stability across different surfaces and wet floors - see section below. As said before, Asics is generally a road shoe, but in this case, the thick and well build sole provides a great grip on both road and trails. Due to its good stability, it is also good for uneven and wet surfaces when needed. As you can see from the pic below, there is a great amount of grip along the sole, with strategic cutoffs for water entry. Another plus for Kinsei here. A very important part of shoe wearing for me is the impact of exercise on the day after. And with Kinsei 6, it is not a straight forward conclusion. At first, I experienced regular muscle tiredness, but after months of usage, as explained above, the cushion of the Gel was no longer as good, and I started to have knee and joints aches. Maybe you will have that, maybe it is just me. Asics Kinsei 6 is the last version of Asics most “Gellish” shoe, and as a result, you can expect a smooth running experience. The construction is a big improvement from the 5th version both in terms of stability and also toebox support. With more than a year of usage, the upper is almost perfect. Something that can also be said for the sole, which is almost intact. Apart from that, I felt a significant decrease in the Gel/Cushion responsiveness over time, which is a disappointment at this price point, but still gives a great, not excellent overall durability. In addition, the stability together with a great grip of the sole provides a good versatility for the shoe, both on uneven and wet surfaces. In conclusion, if you don`t mind a heavy shoe and are willing to spend a good amount of money for a beautiful well-built shoe, then Kinsei 6 worth a shot! PS. Even though the 6th is the last version of the Kinsei model, it seems Asics has abandoned/suspended new releases and substituted the full midsole gel by the 360 model - which I will review later on - without any public explanation. I tried to find something about it but couldn’t, if you know why please let us know. These shoes are designed to provide a high level of comfort, support, stability, and style. This is the number one (and possibly the only noticeable) complaint about the Asics Gel-Kinsei 6, with many wondering if the $200 price tag is worth it when compared to the competition. Exceptional cushioning, comfort, and efficient running are hallmarks of the 6th version of the Gel Kinsei from Asics. This running shoe gives the runner a superior performance thanks to high quality components and technologies that assist the foot in getting the most out of each step. From the heel landing to the toe-off phase, the foot gets protection and cushioning. The upper unit of this Asics running shoe features intense color schemes that are definitely eye-catching. Reflective coating lets highlighted sections shine while different hues & shades give the shoe an appealing look. A mesh material that stretches in multiple directions acclimatizes itself to the shape of the wearer’s foot, giving a glove-like fit. The mid-sole gives the runner a plush and responsive underfoot platform. The foot is given a very comfortable mid-sole unit that’s supportive and efficient. The materials are of high quality, so they don’t easily wear off or break down. The mid-sole lasts long and stays effective, even after many uses. The outsole unit uses a rubber material that’s reliable in its protective purpose. The AHAR® is one of the most lasting outsole compounds out there and it makes sure that the sole unit is protected from abrasion and wear. The Asics Gel Kinsei 6 is true to its size. Men and women can get this shoe with the right measurements when it comes to length. The available width for this shoe is medium, so runners who have feet that are medium-sized can acclimate well to it. The upper is stretchable enough to accommodate many types of runners with individually unique foot-dimensions. Same as with the well known Asics Patriot 10, the shoe uses the AHAR® or the Asics High Abrasion Resistant Rubber which is a very durable layer of protection that shields the shoe from the abrasive nature of the surface. It doesn’t peel off easily and it lasts long, so the sole unit remains functioning and intact, even after long races and multiple uses. Deep flex grooves allow the foot to move more naturally, especially the forefoot section because it’s where most of the foot’s flexibility is centered. Though the sole unit is moderately thick and robust, the foot is still able to do the toe-off phase of running quite efficiently. The FluidRide 2.0 is the next generation of the technology that gives runners a springy underfoot feel. This upgrade is bouncier, so each push-off is much more propulsive. It’s also lightweight in nature, so it won’t drag the foot down. The Gel® Cushioning System is a shock absorbing material that’s placed separately in the heel and forefoot sections of the Asics Gel Kinsei 6. During landings and liftoffs, this unit is able to handle and disperse shock, allowing a more comfortable ride. The Propulsion Trusstic® Technology follows the functions of the foot’s connective tissue. It tenses just before propulsion, so when it’s time for the foot to move forward, the action is more enabled and explosive. The FluidFit® is made up of a multi-directional stretch mesh that has stretch reinforcements. It essentially adapts to the exact shape of the wearer’s foot, making the fit more attuned to the runner. It doesn’t make the upper unit tight or uncomfortable. The Seamless Construction of the upper unit allows the foot to wear the shoe without socks. It greatly reduces irritation, preventing blisters and welts in the process. The Heel Clutching System™ is an external heel counter that supports and holds the rear of the foot in place. It improves the fit of the heel while preventing accidental shoe removals. The ComforDry™ X-40 Sock Liner is a top-tier insole that adds more springiness to the sole unit. It is able to manage moisture and maintain a breathable environment for the foot, so comfort is also enhanced.